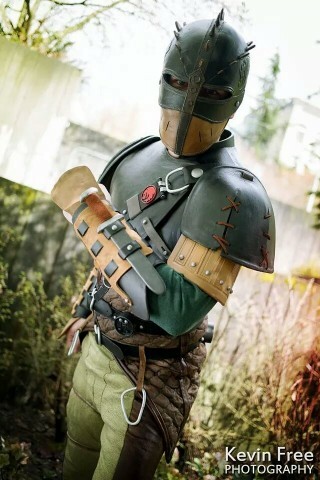 Make a Hiccup Costume and Train Dragons « Adafruit Industries – Makers, hackers, artists, designers and engineers! 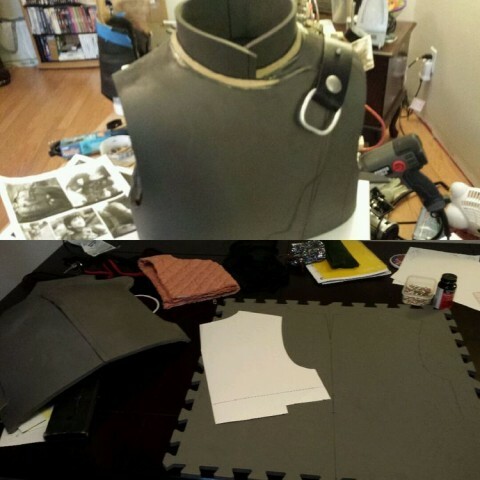 Next was the …leather breastplate? This one was tricky because making a paper or fabric pattern doesn’t work that well when your final material is 1/2in thick and doesn’t stretch. I had lots of trouble getting the foam in the shape I wanted it to. I tried to make patterns and after the first attempt I learned to cut them around at least an inch bigger on every edge and slowly trim everything down. There were a few weak points where the vest joined, particularly under the arms and on the back under the collar where I had to cut out a long upside down “V” to fit the flying fin sleeve in. Adding a 1in wide and 1/4in thick rectangle of foam over the seam on the inside increased the strength immensely. Putting the collar on was a bit odd, the collar stay pattern I found online easily but I had to cut out the correct angle on the vest for the it to sit right and not push against my throat. On the back of the chest armor (for the extendable fin sleeve I) rounded out a strip of floor mat and covered that in two layers of 1/8 craft foam and used a razor blade to slice an opening into the top. Mounted that on some foam that was bigger than the upside down “V” on the back of the armor and contact cemented the thing on, using hot glue to get the edges to it wouldn’t have a chance to pull up. At this time the vest construction was complete but the foam was still nice and neat. While the 1/2inch thickness is great for durability and cartoonish look it was also thick enough to keep its own shape, which did not look like leather shaped to someone’s body. Get all the details on making this costume at Lifted Geek. COOL! thanks for sharing this! we appreciate the support!